Blairgowrie Golf Club ambassador Bradley Neil (centre) will wear the club crest on the Challenge Tour this season. He is pictured with managing secretary Steven Morgan (left) and professional Charles Dernie (right). BLAIRGOWRIE Golf Club has unveiled Bradley Neil as its club ambassador. 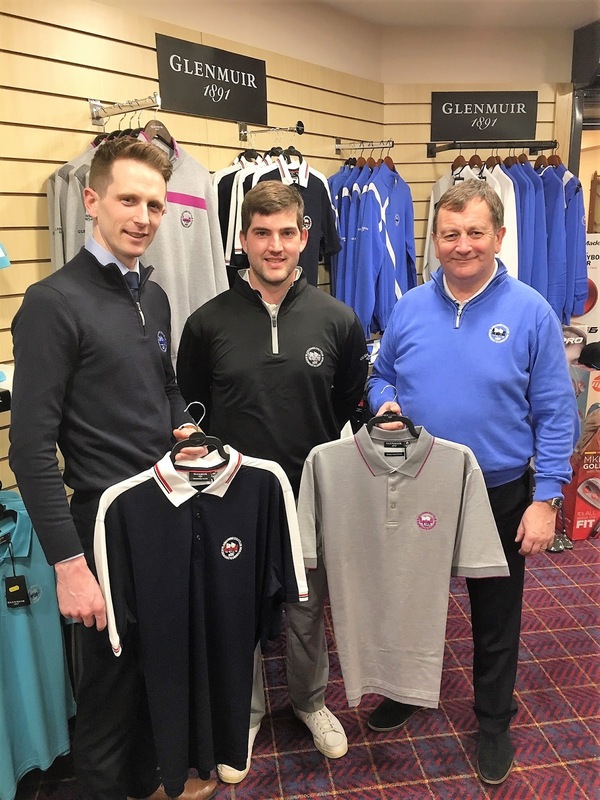 The Perthshire professional, who has his sights set on a top 10 Challenge Tour finish this season to reclaim his European Tour status, will also sport the club badge in a clothing deal supported by Glenmuir. Blairgowrie managing secretary Steven Morgan explained: “Bradley represented the golf club superbly in his junior years and was made an honorary member in recognition of his Amateur win and selection for the Junior Ryder Cup. “He has regularly supported events at the golf club, encouraged our junior section at every opportunity and profiled the club on the European stage. Bradley (23), who is counting down to the first Challenge Tour event in Turkey in late April, said: “I was introduced to golf here with my dad when I was three and the club has been a big part of my life for 20 years now. “I think I was 10 when I first played a match representing Blairgowrie and went on to fly the flag at county and international level. The club name was always there alongside mine on entry lists. “It’s fantastic that the club and such a high profile brand in golf like Glenmuir are supporting me on the Challenge Tour as I look to get back to the top tier. Having tied eighth in a MENA event in South Africa, Neil will fine-tune his warm-up schedule in Dubai and Bahrain. “It’s one step back to take two forward,” he said. “It was great to see David Law winning in Australia recently, with Bob MacIntyre, Grant Forrest and Liam Johnston joining the other Scots on Tour this season. “I have always said we want as many Scots competing at the top level as possible. Hopefully they all do well and I can join them next season. “Scottish Golf and Sport Scotland have been very supportive to me and others. “It tends to go in stages and I know the U16 Scotland team is fantastic. Bradley was the first Perth and Kinross player for 40 years to reach the top tier. “I have had a lot of time to analyse what went wrong last year. I have used it positively,” he said. “I have been happy with the progress I have made on and off the golf course. My form was good in South Africa in a recent high profile event. It was very encouraging so early in the season. “It was hard to make improvements, given the schedule last year on the full Tour and doubts began to creep in. It was especially annoying not to put together four rounds of my best golf. “There were a few low points but I have had great support from various quarters. “I have been figuring out what I need to do with my new coach, Fintan Bonner at St Andrews. “I want to make sure there is not an inkling of doubt in any part of my game when the Challenge Tour begins. “I know I am a better player than this time two years ago when I was starting out on my first full season on the Challenge Tour. I have more experience behind me. “The target for the season is to regain that full European Tour card.